- Each Besgoods' usb extension cable is tested strictly before delivery and provides premium performance. Thus we stand behind our products 100%! - Corrosion-resistant, gold-plated connectors ensure excellent conductivity and optimal signal clarity. - High quality PVC jacket provides higher durability and increased flexibility with tangle-free. - Full USB 2.0 Capability ensure high speed data transfer rate up to 480 Mbps. 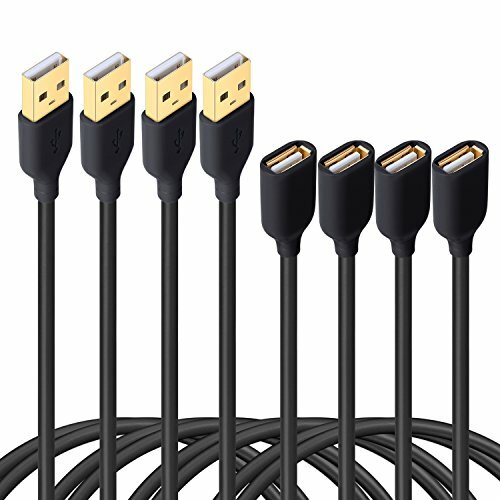 Using these usb extender cords to extend the extra reach between your Computer (Mac/PC)/ Windows tablet and Most of USB 2.0 peripherals, including iPhone, keyboard, camera, printer, mouse, external hard drive, card reader, Smart phones, VoIP phone and more. - Still feel trouble with short charging cable? - Want to run a wired keyboard or other USB-enabled device across the room? - Tired of crawling under the desk to plug something into your computer? - These USB extension cord give you that extra length to relax and not worry about your battery dying. You even can keep it on tablet or PC to protect the usb ports of your tablet/PC from damaged due to repeated plug &unplug. Instead of buying every wire/micro usb cable 10 feet long, you can purchase it and use this to extend extra length! Saves your money and a lot of space! PREMIUM USB 2.0 EXTENSION CABLE: 1.83M/6Feet USB extension cable allows you to extend the cable connection between computer (Mac/PC)/ Windows tablet/ Wall Charger and other USB-enabled device, such as iPhone, keyboard, camera, printer, mouse, external hard drive, USB Flash Drive, card reader, VoIP phone and more. CONVENIENT & MULTI-USE USB CABLE EXTENDER: Perfect for lengthening a device connection when existing cables are too short, avoiding the possible damage of the usb ports of your wall chargers or computers due to repeated plug &unplug, and you can keep the USB ports at the desktop or anywhere you want. HIGH PERFORMANCE: High quality tinned copper interior provides superior cable performance and error-free data transmission. Full USB 2.0 Capacity guarantees high speed data transfer up to 480 Mbps. WHAT YOU GET: 4-Pack 6ft black USB extension cord in one package; We stand behind every product by offering 18-Month warranty and 24 hours customer service! If you are not satisfied with our service or product, please contact us firstly. If you have any questions about this product by Besgoods, contact us by completing and submitting the form below. If you are looking for a specif part number, please include it with your message.